To display real-time bus information at stops that do not have access to a power source, Surtronic developed a unique product: Flexpaper. For our Flexpaper displays, the power supply is realized through a combination of solar cells and a battery. By applying LCD display technology and efficient optimization, the energy use has been reduced to a minimum. With the FlexPaper concept, Surtronic has developed an environmentally friendly product line, able to operate autonomously on solar energy, without high installation costs and simply to install at every possible location. Flexpaper is an energy efficient stand-alone powered bus stop display system for real-time information and timetable to passengers. The latest product development uses innovative E ink technology displaying remotely controlled timetable information. It provides a smart and environmentally friendly solution, powered by fully integrated top and rear solar panels with battery backup and an intelligent power management system. The efficient installation and maintenance process provides the best Total Cost of Ownership (TCO) possible. Seamless interface with the back office systems of the transport organisations. A secure web-based back office system provides remote maintenance and management facilities. Authorised users are able to visually check the status of displays as well as the overall system. Users can remotely configure the displays and perform software and configuration updates over the air (OTA), making the Flexpaper E Ink ideal for Smart City applications. In 2014, Surtronic has installed a total of 109 Flexpaper units including Text to Speech for our customer the City of Haarlemmermeer via Dynniq. Recently in 2018, an order of an additional 25 units was placed by our customer. 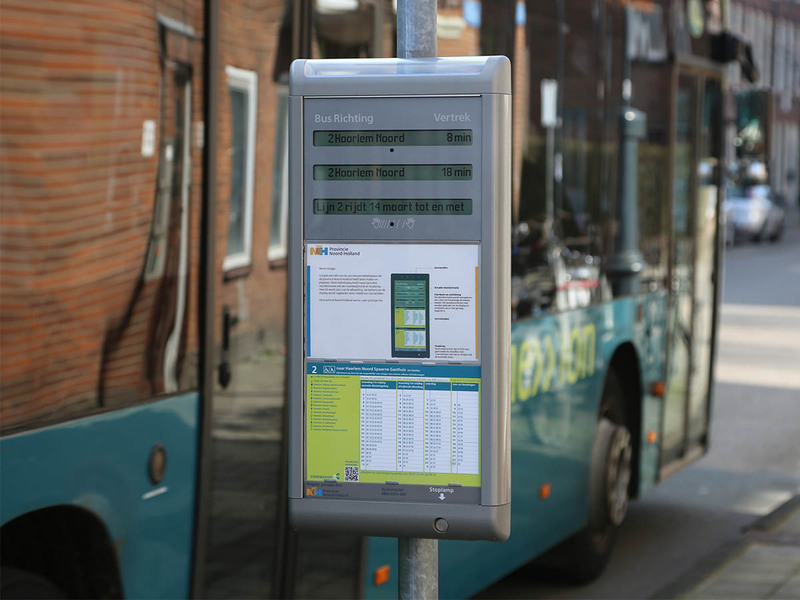 The City of Haarlemmermeer requested around 100 Flexpaper units to present real-time passenger information on a number of strategic points throughout the city. A great benefit proved to be the fact that no power connection is needed to link the Flexpaper units to the network. The units operate autonomously by using solar power supported by a battery.